Moving the ball from one player to another can sometimes be a hand-off in sports. A figurative use of the word can be found in commerce when a national trucking firm hands-off shipments at a hub to a local carrier. A consultant may be brought in to a business to develop the outline of a new system and then hand-off the project to the in-house staff. In the field of music where the figurative ball can be a melodic line, a rhythm, or even a (sonic) feeling, a composer or orchestrator will hand something off from one instrument, section, or group of sections to another. A common example might be when a melody is played by the violins and as it descends to a lower range, perhaps too low for the violin, it is taken up by the violas or cellos. This commentary reviews pieces by Debussy, Elgar, Puccini, Ravel, Saint-Saëns, Strauss, and Tchaikovsky and discusses examples of these composers using this technique. Short audio-video examples with scores are included. A student or interested listener would benefit from study of additional examples in these and other works. Edward Elgar’s Enigma Variations (“Variations on an Original Theme for Orchestra”) had its premiere in 1899. Probably Elgar’s best known work, save for the first of the Pomp and Circumstance Marches heard at more than a few school graduations, it is rich with examples of the hand-off. In Variation VI (Example 1) of the Enigma Variations, the clarinet plays a rapid, upward arpeggio ending on a staccato quarter-note. The pattern appears three times in this example. Each time the final, highest note is sustained by the flute entering on that note. Although this is secondary to the melody played by half of the violas in their upper register, it appeals to the ear balanced with the staccato figures in the lower strings and bassoons added to the rhythm of the passage. Changing the timbre at the top of the arpeggio creates interest and is enhanced by the violas doubling the flute down an octave. On the third beat of the measure this line becomes a suspension, resolving on the second half of the last beat (counting in 3). Note too that in measure five of this example, the first flute has the arpeggio this time, handing off the top note to the second flute, now doubled an octave lower by the second violins. Orchestral tone can at times be unrefined and coarse as, for example, when a brass figure is added to an existing string pattern. However, there are times when the subtle act of handing off the end of an arpeggio from the first to the second flute can add a minor but perceivable change in color, adding to the interest of the listener’s ear. Sometimes the hand-off can be between sections of the orchestra. At other times it can be between parts of the same section. In rapid succession the movement can charge a work with excitement, especially for a live audience. They may hear the sound coming from different places in the orchestra. 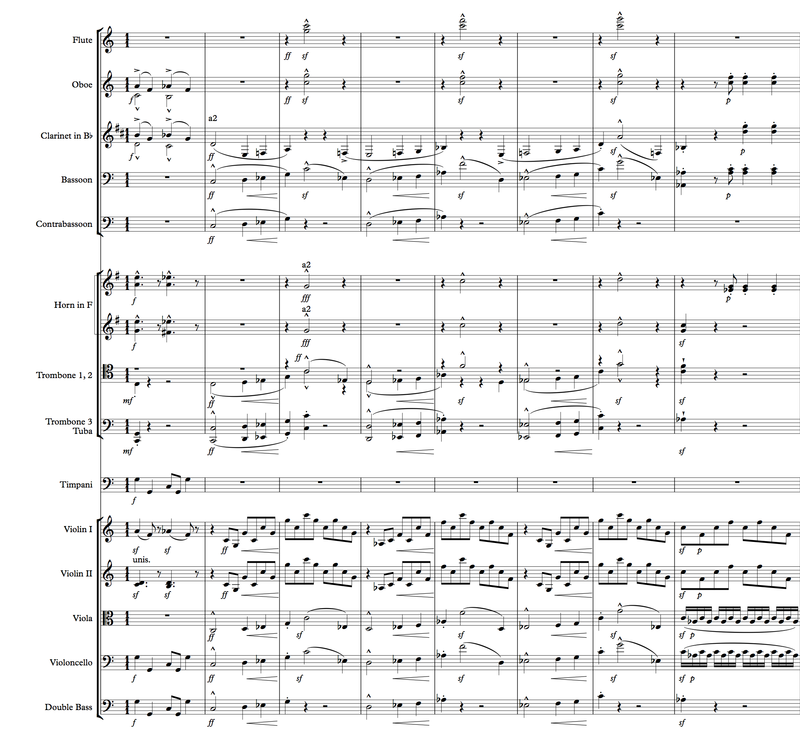 The next example remains in the Elgar work and it reveals a movement of the melody and its harmony, a sixth below, from the woodwinds to the strings. Example 2 is the very opening of Variation VIII. It begins with the clarinets, adding the flutes in the second bar. In the third measure, the flutes and clarinets end on an eighth-note, which is taken up by the first and second violins. The very simple movement from winds to strings changes the color of the sound as the entire string section enters to support the upper strings. 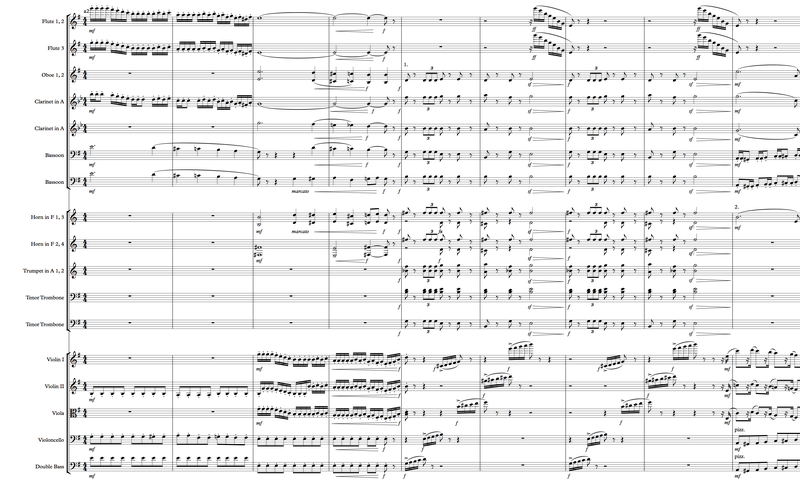 In one more example from the Enigma Variations, the movement between the two previously cited ones, in a dramatic change of pace the hand-off is nominally distributed throughout several sections of the orchestra. However, what is most apparent is the almost seamless movement between the trombones and the horns. Although the trombones play the melody line along with clarinet, bassoons, tuba, and lower strings, nothing is more evident than the lower brass. The accents provided by all the horns (marked triple forte) on the second beat of the second, fourth, and sixth measures add to the fluidity of the melodic line. Because the section moves by rapidly, it is played twice in Example 3. The first time the visual highlight is on the cellos. 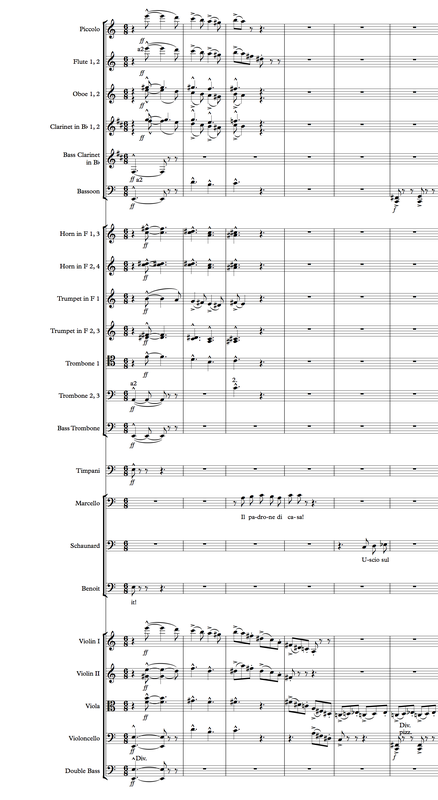 On the repeat, the trombones and horns are highlighted. It’s an exciting passage and instructive on how to use the different timbres of brass instruments as one section. There are some occasions when a composer can receive other benefits from this hand-off technique. In addition to the excitement it can add to a passage, it can also help to reduce boredom in a second or third part or player of a section, especially in parts that are frequently reduced to secondary roles, like rhythmic off-beats. In this next example (from Maurice Ravel’s Le tombeau de Couperin, Prélude. Example 4), note how the composer passes a descending arpeggio from the first to the second bassoon and then back to the first. It’s not that the passage is of prime importance, yet it exemplifies a respect for all the players in the orchestra, not just the first chairs. Additionally, if a passage is very fast and difficult to play, in less than world class orchestras it can help to make the performance successful by splitting the part between players. One additional point: similar to Example 1 in Variation VI of the Elgar cited above, a clarinet arpeggio hands off at the top of its part to the oboe. Yet, if you’ll listen closely (and see the highlight in the score) you’ll note that the clarinet does not reach the top of its arpeggio. Instead, the oboe hits the actual note, supported by the harp. The clarinet plays the third of the D minor chord (a concert F) on the downbeat of the measure. In the opera La bohème by Giacomo Puccini there is a passage where a group of poor, young artists are interrupted by the landlord at the door, demanding the rent. As soon as they hear his name through the door the orchestra plays a few measures of a loud “stressed” passage (mostly through diminished chords and arpeggios). In this particular, brief section the landlord growls his name “Benoit” and the character “Marcello” explains that it’s the landlord to his comrades. After the first few chords in a fast 6/8, two beats per bar, the first and second violins play descending (D-sharp diminished seventh) arpeggios for two beats. On the downbeat of the following bar, the seconds drop out on an F-sharp as the line is taken over by the violas. On the next beat, the first violins play their lowest note of the chord, an A, and the cellos are now playing in unison with the violas until the following measure when the violas move to a rhythmic accompaniment. Example 5 is typical of a composer’s desire to extend a descending line that requires different instruments because of its range. Naturally, the string section, being the most consistent across the voices, achieves this with ease. Because the passage is so rapid, Example 5 plays the section twice, first displaying the entire score. It is immediately repeated displaying only the strings with highlights of each group. Moving the rhythmic pattern can be just as functionally successful in shifting color as moving a melody. This movement may not be for the reason of extending the range, but for the purpose of changing the texture of the sound. Example 2 showed how Elgar had a melody in the clarinets, added flutes and then turned it over (handed it off) to the violins. The next example (Example 6) features a short passage in the second of Claude Debussy’s Nocturnes for orchestra entitled “Fêtes.” Although this work is from the same year as the Elgar Enigma Variations, it is harmonically quite different. This passage shows Debussy moving a triplet pattern, which is both rhythmic and harmonic, from the woodwinds to the strings. After dual harp glissandos, a previous 4-beats-per-measure pattern changes to two measures of five beats (15/8 time). The composer then returns to a previously introduced melody, but now presented in 3-beats-per-measure (9/8 time) rather than 4. The melody is played by the flute and oboe with the string section accompanying them. The hand-off occurs right on the downbeat of the time change. Once the time changes to 9/8, a relatively regular 3-beats-per-bar pattern is set up. As you can hear and see in the score, Debussy adds the timpani and horns in a small, but important rhythm to support the new time change. With the timpani playing a triplet on the third beat of the measure and the horns emphasizing the ensuing downbeat, the waltz rhythm becomes regular. Although it may seem like a small gesture, when listening try to imagine the orchestra without it. It will surprise you to hear how compelling this touch is. A trio of examples will round out this commentary. Each exhibits a hand-off similar to the others above, but with unique and surprising element in them. Example 7 looks at Richard Strauss’s tone poem Don Juan. In this example Strauss uses the power of the strings to play and repeat a pattern from the bottom of the cellos to a high G in the violins. The passage is similar to the end of the development section of the first movement of a symphony, also known as Rondo-Allegro form. After a brief pause, the winds begin with deceptive, shifting harmonies supported by a pedal bass in the bassoon section (assisted by timpani and harp). When the cellos introduce the dotted-quarter, followed by three eighth-notes that jump up a sixth and finally to the octave of the initial dotted-quarter-note, they introduce a pattern that spreads to the violas, second violins and then firsts. While not as literal a hand-off as some of the earlier examples, it displays the confidence of the composer’s string writing to build on this pattern. The passage crescendos and it’s difficult not to get caught up in the excitement to the return of the main theme in the ensuing bars. There are few items that bear attention. 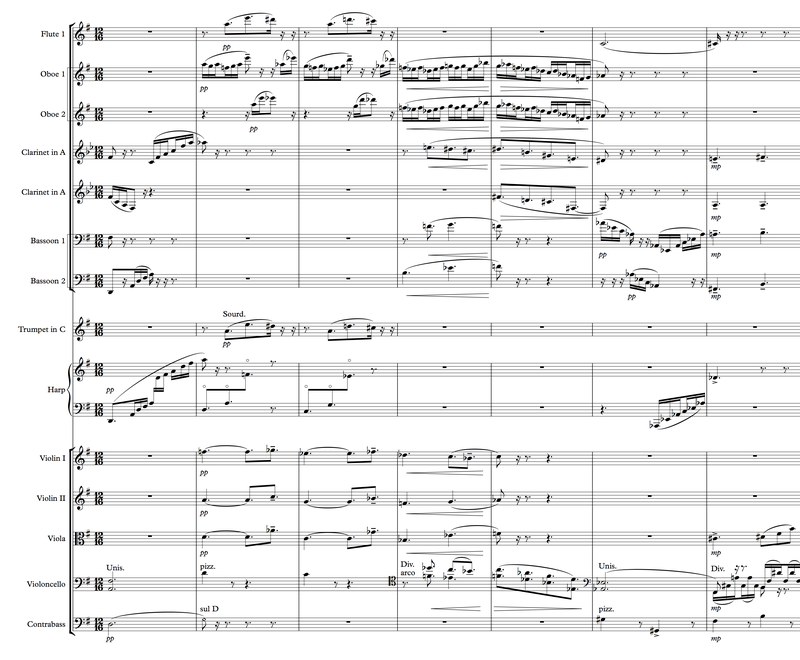 First is to note that there is nothing else happening in the orchestra during the middle of this passage. In addition to the “old reliable” timpani roll being absent, the composer drops the pedal G from all the other sources. However, in the last two measures before the string tremolos begin, he has the oboes doubling on one and three of each measure, playing half-notes on the same beats as the strings. This secures the resonance of those downbeats in addition to creating a louder and differently colored sound. Then, in the final three eighth-notes of the passage, the clarinet and flute – doubling the first violins and violas – assist in topping the passage before handing off the ultimate note (a G) to the oboes. In the strings, Strauss has the insight to give the violas the top of the tremolos supported by the second violins an octave lower. In this register, the violas will sound both resonant and bright. Finally, the violas hand off the tremolo to first violins just as the horns are about to introduce the main theme. It’s a creative example of doing a great deal with just the strings, enhanced by a few winds. 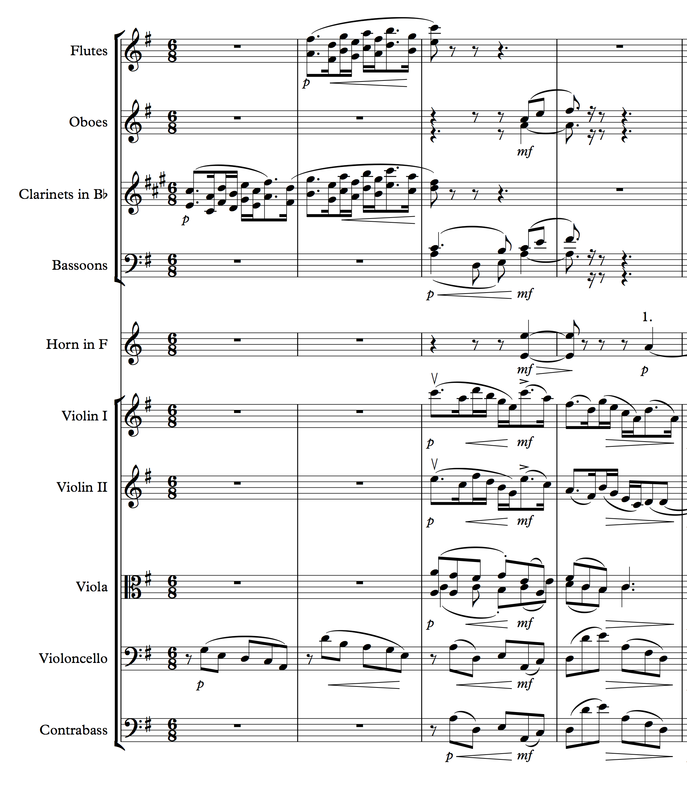 Towards the end of the little piece for orchestra by Camille Saint-Saëns, entitled Danse Macabre is a passage that has a rapid chromatic scale broken between two halves of the first violins, a two-octave passage that is repeated (Example 8). Half of the first violins play the first four notes of the scale and stop on the fifth. The scale is then handed off to the second half of the section that plays the next four notes and stops on the fifth note. This pattern continues up for two octaves, down for two octaves, up, and then down. This passage starts after the second violins and violas play the melody in octaves. Once the chromatic scales begin, the lower strings, enhanced during the passage by the violas, and the second violins play a snippet of the main melody. 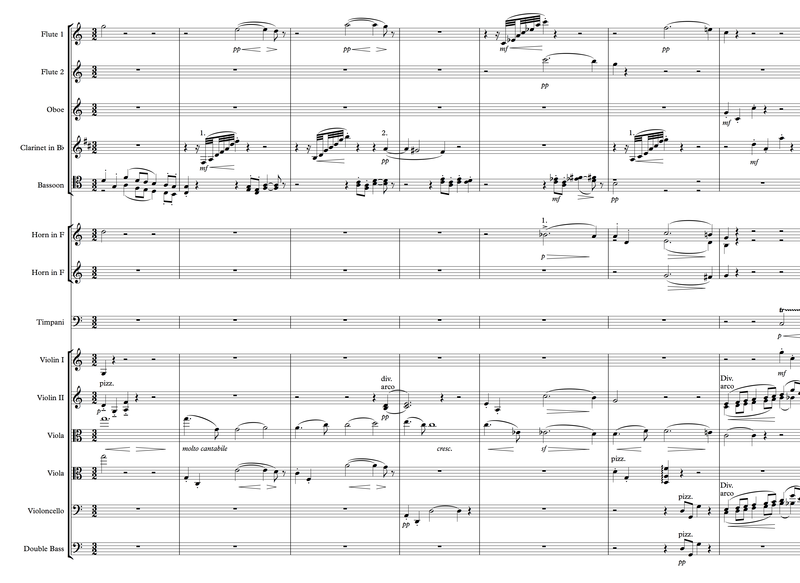 Note how two trombones double the three quarter-note pattern on the second half of the two-measure repeated fragment. One of the details that helps to make this passage (as well as most of them listed here) work as a seamless scale is the hand-off notes. For instance, the first half of the violins stops on a sixteenth-note D-sharp and the second half begins on the same note. In a small way, this helps to make that downbeat a little stronger because, for the downbeat (the hand-off), the entire first violin section is playing together. 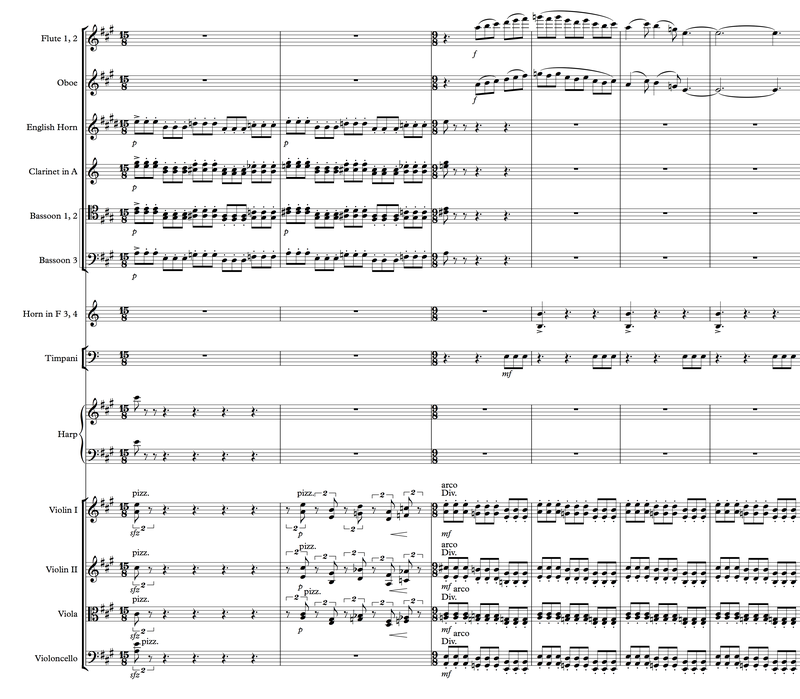 For this commentary’s final example we’ll examine the March from Peter Illich Tchaikovsky’s Nutcracker. In the ballet it follows the first scene, which is the decoration and lighting of the Christmas tree. The effect of the two notes sounds simultaneously is surprising. It’s certainly not the usual hand-off that has been discussed. The clash of the two different notes has the effect of accenting the beat of each measure. Although most of the rest of the orchestra is playing the staccato melody heard at the beginning, the strings move from the double basses, here not partnered with any other instrument, to the cellos, to the first violins, to the violas, to the second violins, and finally to the firsts again. This climax is not handed off, at least not at the exact same time. Instead the flutes pick up the second sixteenth-note of the third beat of the bar and play a descending E minor arpeggio. The overall effect of the clash of the notes is one of the long rising scalar pattern sounding almost like a glissando. 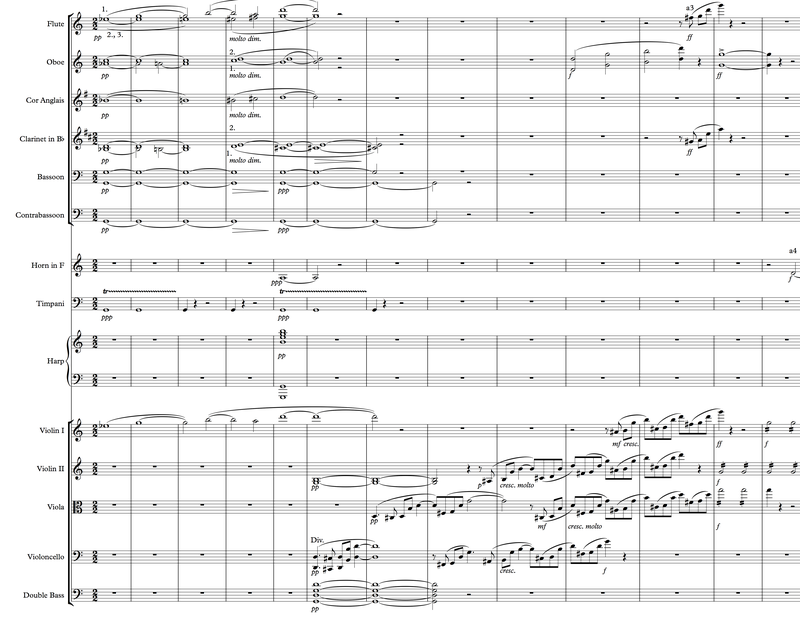 Given the slight dissonance in the on-beat string passage it’s not surprising that the first descending arpeggio ends on an E, even with the D in the trumpet melody, doubled in the oboes and clarinets, and the remainder of the winds play a G major chord. Let me offer one last note about the two measures prior to the start of the melody and the string hand-offs. The top horn part has a half-note E, followed by chromatic quarter-notes, and ultimately eight-notes. In itself, this is not a “big deal,” yet it highlights an additional element used to build excitement in the sound of the orchestra. The passage in the fourth measure of the example changes chords rapidly and the diatonic sixteenth-notes in the upper strings display a contrast to the chromatic passage in the quickening of the winds. Tchaikovsky has been building this E minor middle section and needs to change the tonality to return to G major. This orchestration itself is an element in that return. Lesser orchestrators might use a harp glissando or percussion effect to enhance the climactic return of the melody. This composer uses none of that here. He simply uses the tools that he’s been working with throughout the piece. Creating a standard and passable sound from an orchestra is not too difficult for most students of music. What’s much more difficult to achieve is creating the subtleties that make listening to music interesting. The examples presented here provide but a few minor options available for the creative orchestra composer. The orchestra can provide the writer with many techniques to entice the listener to pay attention, to add to the sense of engagement, and to make a piece’s sound unique and compelling. Composing with the sounds offered by the instrument known as the orchestra will assist the writer to create a more robust and sonically satisfying piece of music. The challenge is in the creativity.